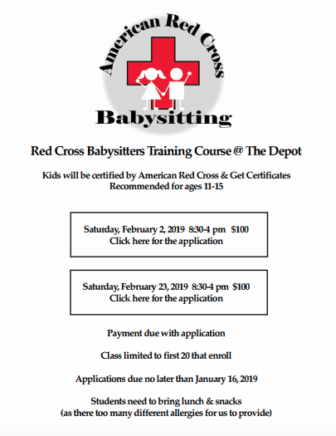 The Depot Youth Center will once again be offering the American Red Cross Babysitters Training Course on Saturday, Feb. 2 and Saturday Feb. 23, 2019 but only for the first 20 sitters to enroll, so get your application in ASAP. No, no, no, no — don’t click THERE for the application. Click on the links in the article. This course is aimed at middle-school aged students ( 11 to 15 years old). Students will be certified by American Red Cross and receive certificates. Payment of the $100 fee (by check) is due with application. Applications (you can find the form here for the Feb. 2 class and here for the Feb. 23 class) due no later than Jan. 16, 2019. The course, on Saturday, Feb. 2, runs from 8:30 a.m. to 4 p.m. Drinks will be available, however, students need to bring lunch and snacks, as there are too many allergies for us to provide.